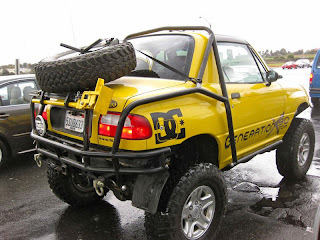 Why it's a lifted Suzuki X-90 on the streets of Carlsbad. Generally regarded as both a sales flop as well as a "secretary's car" (especially when painted in an all-too familiar mid-90s purple metallic), this one's seen some heavy modifications. To each their own, but I have to wonder why the owner didn't just start with something more than an underpowered bulbous soft-roader. Might a Jeep or a Toyota FJ40 have been a better platform on which to build a vehicle to take out to Ocotillo Wells? Reminds me of the ricer kids who try to make their wheezy 90 HP Civic DXs with 5" fart cans (blatting out a horrible exhaust note, natch) into fast cars.